Every event is different, but there wouldn't be many organisers the world over who don’t share similar goals of wanting to sell more tickets; doing so sooner; and achieving maximum ticket yields. And, as with every other part of running successful events, planning is key. So plan for further ticketing success for your next event by incorporating some of these commonly deployed ticketing strategies. But first, why is it good to sell tickets early? People who have committed to your event by buying their tickets are your active advocates; your word of mouth advertising; or your (free) promotional marketing team. The more of them there are the better the effect. Moreover the more early sales you get in the more revenue you have earned, and if you use a ticketing provider such as Ticketebo then you will be able to access funds from these early ticket sales to invest now in making the event even better. 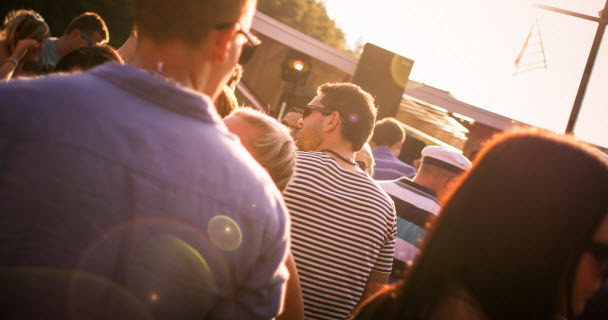 A strong early ticketing campaign can be the difference between having the funds available for that TV ad campaign or a new major headline act! A common stage to kick start your ticketing campaign is via a pre public ticket release. Everyone likes being given the option to buy something others can't yet purchase, so rewarding your members/previous customers/your sponsor's customers with the opportunity to get in first can be a very effective launch campaign. Typically the Pre-Release campaign is your first campaign to launch, where the link to the ticketing webpage might be emailed directly to your chosen customer base (at a time when on your website tickets are not available for sale). Consider anything additional you might want to add to the mix as inclusions for this release – this could be the Early Bird price point, free merchandise etc. [Though if your event is an allocated Seating event, just getting access to the best available seats should be a good incentive on its own]. This release stage is probably the most popular ticketing strategy we see deployed to deliver early sales. Usually this is a price incentive aimed at encouraging 2 important groups to buy their tickets now. The 1st group are your event's biggest fans, who buy their tickets as soon as they are available. Once they have their tickets they will start telling the world they are going. The 2nd group are the price sensitive customers - who will be attracted to the great value this ticket release represents. Getting your early bird strategy correct can be a critical step in ensuring the success of your event. For a more detailed look at Early Bird ticketing see the more extensive article about Early Bird strategies here. A percentage of your customers will like your event so much that they want to experience the very best it can deliver, and will pay extra for the privilege. Look at how you can satisfy their higher budget and desires by offering additional premium ticket options. But make sure these options are genuine premium offerings. Special access privileges, event merchandise, reserved sections at your event, meet and greet opportunities with the stars of the show - are all popular options for including in your premium packages. You may be pleasantly surprised to find that the first ticket tiers to sell out are your most expensive ones! Two of the most powerful and rewarding words an organiser can display on their event page is SOLD OUT. As quickly as possible aim to have ticket types displaying on your ticketing page as sold out. It tells everybody (including potential sponsors) the event is selling well, so they too need to commit. It will also remind people that had they got in sooner they would have got access to better seats/cheaper tickets (which they will remember for next time, and give your subsequent event a boost). By offering strictly limited Pre-Release and Early Bird stages you can ensure you have at least 2 ticket tiers displaying as sold out for the bulk of the ticketing campaign. Offers are a hugely popular way to shift stock in the retail sector. Likewise we see event organisers adopting many similar techniques. We recommend planning into your ticketing campaign several short promotional sub-campaigns where you might offer your tickets/registrations at a discounted rate (or maybe a free upgrade). It is important to plan these into your campaign even if you don’t end up running them, as hopefully sales are going so well you don’t need to execute them. Examples of Promotional Offers we often see are X% off tickets for the weekend when using Coupon code “XYZ”. Groups receiving the offer might be your customer database (washed against those who have purchased already so you are not spamming them), your Facebook fans or other social media followers. Unique offers (so you can also track their success) could be released to the databases of organisations you are affiliated with (eg your exhibitors/sponsors databases). Repeat customers are critical to the success of any event. They are also the cheapest to market to (as you should have their contact details). They won’t all jump in at the Pre-Release stage, so think creatively about other ways you can still reward them for their loyalty so they commit to coming again. Can you provide them Express Entry or Early Access to the venue? Is there a members area they can use (where the bar/toilet queue might be shorter)? Otherwise known as the “if I dither any longer I won’t get in" release stage. As the name implies this is the final release (before any gate sales), and is usually more expensive than the earlier releases (certainly never cheaper). Just the word “Final” in the ticket title delivers that important extra impetuous for customers to commit and buy their tickets, or risk missing out completely. If you are not charging more for tickets sold at the door then you are missing out on a critical ticketing step. Unless tickets sell out before the day, you will get door sales - and the extra money these people pay per ticket will negate revenue lost from your earlier discounted ticket releases. 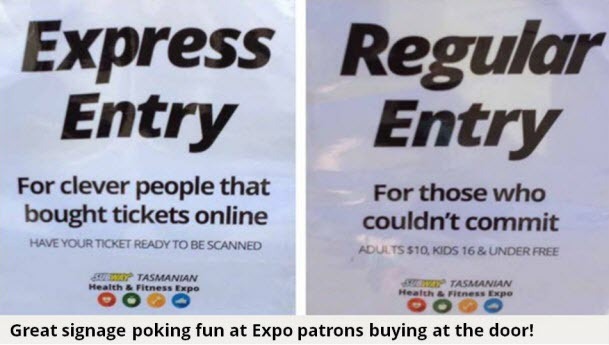 Ironically choosing to charge the same amount for an online ticket as at the door will in fact encourage people not to commit as there is no incentive to do so. And if they haven’t committed to buying a ticket they also won’t deliver you the positive Word of Mouth promotions effect. Plan to charge more from the start, and promote this in your advertising. This will drive increased online sales, which in turn provides you valuable customer contact details for future event marketing. There are lots of ways to ensure your ticketing campaign is continually moving in the right direction. And not all campaigns should be built around discounting. The key to it all is good planning. Know your revenue numbers and how you are going to hit them through your planned ticket releases. Know what your contingency campaigns look like and how the remainder of your campaigns will need to adjust if sales are behind at any point. Expect the best for your ticketing campaign, but plan for the worst - then you will have every eventuality covered! What other ticketing strategies work for your events? Share your best ticketing strategies with other event organisers using the comments section below.